As dusk came the sky was a heavy mixture of black and large slowly counter-clockwise rotating swirls of light gray. It was a gradual transition to darkness with the larger stars coming into view just one or two at a time, which were easily visible through the leafless branches of the April Cherry trees and Tulip Poplars. The swimming pool was heated, but it always felt cooler in the evening darkness during springtime months. The water’s surface felt like a thin cellophane-like coating that had negotiated a temperature midway between the warm 84-degree water and the cool 50-degree air. As always, I swam quietly and efficiently, in part to avoid cold facial splashes and unnecessary hair wetting while I nonchalantly enjoyed my own time and space during my evening exercise and decompression period. Although, it was debatably exercise—I doubt a single calorie had been burned as I glided silently across the pool like a stalking salt-water crocodile. Most times, including evenings, I would have a drink out with me by the pool. Tonight, on this chilly evening, I had a hot coffee in one of those redundant plastic Starbucks’ mugs that my daughter buys obsessively. The coffee waited for me patiently at the pool’s edge, as a reward for distance completed—for some rounded-off number of laps back and forth under a developing portrait of emerging stars. Nearing one of the evening’s Olympian goals at the pool’s edge I reached for my hard-earned refreshment, only to be thrust unexpectedly into total darkness. The stars, the tree silhouettes, and the fading light reflections from the cloud cover all vanished instantly as my eyes closed tightly, involuntarily, and reflexively. I felt considerable pain, both dull and sharp, like a striking blow, squarely between my eyes. I recoiled into the pool, never having reached the coffee. It seemed to take ages for my eyes to open as both my hands instinctively applied pressure to my face. All the while, my brain was analyzing events, without the benefit of vision. Was I smacked by a falling tree branch? Did an errant wind thrust some heavy garden implement into my face? As my hands slowly and deliberatively unclasped, my pupils dilated filling with light, exposing the source of my anguish. It was a Procyon lotor—the ubiquitous North American raccoon. My ocular functions regaining, I stared at Rocky in shock with my arms akimbo. He was a beautiful specimen who had seemingly come straight from casting for the sequel to Guardians of the Galaxy. He stood there motionless and stared right back at me, with little powerful outstretched arms unmoving. The medium-sized omnivore then glanced down at my iPhone 6 Plus, which was sitting next to my coffee and I thought, just my luck, he’ll make off with that too. However, evidently I had yelled loudly in unreserved fright when I was struck and my pet dog Lucky was now charging raucously from the inside of the house to effect my rescue, at which point a small-scale keystone cop chase ensued and the non domesticated animal vanished into the night. A tragedy of immense proportions started to unfold before me. 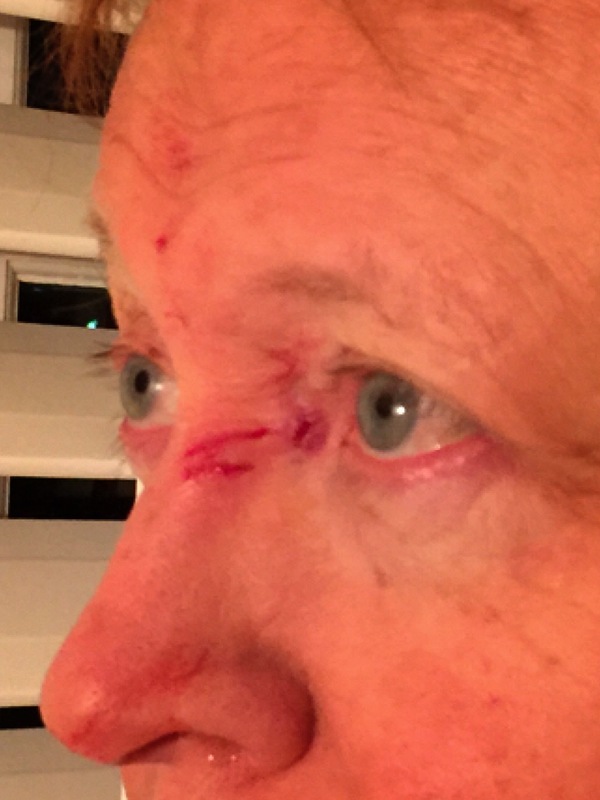 As a self proclaimed animal lover with a particular fondness for native North American mammals, to be mauled by a raccoon in my backyard, during my nightly Zen swim, was akin to assault by one’s own teddy bear in Kindergarten. It was nothing less than a massive breach of trust and a complete violation of all the best Animal Planet reruns. Somewhat shocked, I climbed slowly out of the pool, dried myself off, went inside and cleaned up my face, revealing a large assortment of cuts across the bridge of my nose, my forehead, and fairly close to my left eye. Under pressure from my lovely wife I dutifully called animal control to report the incident. They were all business and immediately employed well-rehearsed fact-finding interrogatives. Did it bite the dog? Did it make contact with the dog? How did it run? Did it move easily? Did it bite you or scratch you? Were its paws wet? I answered as best as I could but the wet paw question was a bit Monty Python I thought considering I was swimming and splattered with my own blood. But I saw no little wet paw prints leaving the scene of the crime, which I offered up lamely as potentially useful information to the investigator. General consensus was building that I had been scratched and not bitten, and although the animal may not have been rabid, there was a chance, perhaps a sliver of a possibility; I had been exposed to rabies. With less than 60 minutes transpiring since my mammalian assault there were now three advisors debating my next actions. Compounding the situation was other medication that I was taking for some unrelated ailment and the possible interaction with the rabies vaccine in my anatomical petri dish. Since no current advisor’s Venn diagram yielded the appropriate shaded part for an informed decision the list of advisors grew swiftly. Those for the inoculations were the emergency room (ER) on-call Hematologist, Fairfax County animal control, an infectious disease specialist, the Fairfax County rabies guy and his boss who was affiliated with the U.S. Center for Disease Control. On the antibody fence were my lovely wife, Lucky the hero dog, and against was an ER nurse who said she had no idea what should be done. Throughout this cacophony of phone calls, maturely I locked myself in the bathroom and took a series of laceration selfies for possible future blockbuster release on the Internet. After my photo shoot, I returned just in time to hear the results of the rabies referendum. Rabies vaccinations are performed as a series of injections over a several-week period. Apparently, just a few years ago, possibly stemming all the way from the Middle Ages, inoculations were provided directly into stomach muscle tissue, presumably with some rusty blunt pre industrial revolution farm implement. However, nowadays, it’s a lot more straightforward and less invasive where about a dozen injections of rabies immunoglobulin are given to the wound site and various limb-related muscles. It’s not really that painful, probably more mythical, but the ER nurse was cute so I accepted her offer to hold my hand while my grimacing face directly absorbed the remarkably viscous concoction from her syringe. It was strange to me, however, that all my follow-up injections would also be dispensed in ER and not in some raccoon specialist’s office. Like most folks I don’t really hang out much in a hospital’s ER facility and going there can be a bit unnerving as well as like rolling dice. Most times there is nothing going on while Anderson Cooper’s head covers some mild breaking news somewhere. But other times some tormented, loud, groaning man is wheeled in on a gurney holding his crotch and hogs all the attention and resources. You can’t really complain about that if you just popped in there after breakfast to receive injection number four. At this time I have only one more injection to receive before my conclusive blood test exposé. I’m feeling quite optimistic—so far the full moon has not influenced any unusual nocturnal behavior. Fairfax County continues to track my progress with boundless diligence, including observing that I show up for each injection as scheduled, and where I receive the injections anatomically. I assume their primary concern is my welfare and not whether I might bite someone. As for me, I assume that it is safe to get back in the water and I hope the raccoon is doing well and not too deeply scarred by the experience. This entry was posted in Life Review and tagged emergency room, ER, Guardians of the Galaxy, immunoglobulin, Rabies, Raccoon, Rocket, Rocky. Bookmark the permalink. Nice one, Alex. Must have been a bit shocking at the time but you recovered well and in good humour.